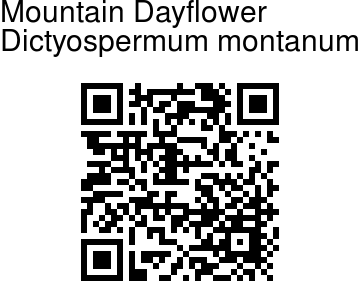 Mountain Dayflower is a herb with leaves clustered towards tip of stem, 5-13 x 2.5- 5 cm, elliptic-lanceshaped, base narrowed, tip tapering; leaf-stalk to 1.5 cm long; sheath to 3 cm long. Tiny flowers are borne in panicles at branch-ends, 8-17 cm long, covered with hooked hairs; bracts leafy. 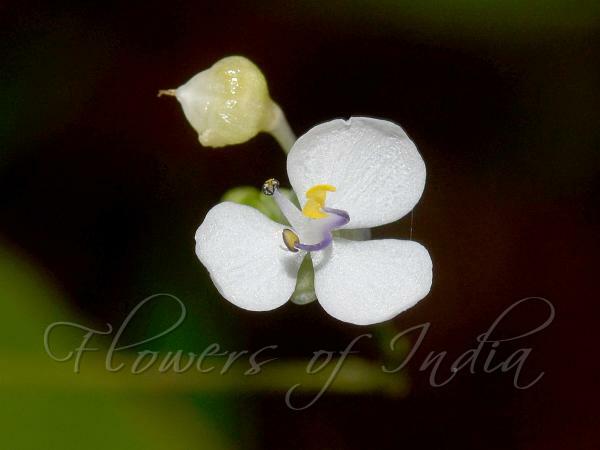 Flowers are white, 8-10 mm across; flower-stalks 4-7 mm long. Sepals are 3, 3-4 x 2-3 mm, obovate, blunt, concave. Petals are 3, white, 5-6 x 3-4 mm, ovate, blunt. Stamens are 3, filaments 2-3 mm long; no staminodes. Ovary is 3- celled; about 1.5 mm long; ovule 1 in each cell; style about 2 mm long. Capsule 2-3 mm across, spherical, hairless; seeds hemispheric, wrinkled. Identification credit: Mayur Nandikar Photographed in Chimmony WLS, Kerala.